A Deeper Look: Should Agents Use AdWerx? » warhol + west :: real estate marketing. warhol + west :: real estate marketing. / Marketing News + Trends / A Deeper Look: Should Agents Use AdWerx? When it comes to digital advertising – or really any sort of advertising for that matter – everything boils down to one thing: value. Every form of marketing, whether you’re printing an ad on the side of a hot air balloon or buying a full page spread in your local newspaper, can be a great opportunity if presented with the right price vs potential lead conversion rate and impact. So when given the chance to examine AdWerx’s services a bit more in depth, we were excited to see what results this company was able to offer! Background / Disclaimer: Over the years, we have worked with a dozen or so agents who have, or currently use, AdWerx’s services. We are not affiliated with AdWerx in any way and simply wish to provide our opinion as to whether agents should or should not use their services based on some anecdotal evidence. For those who would rather skip ahead and simply want to know whether they should use AdWerx: Probably not. AdWerx is a digital advertising platform that allows real estate agents a relatively easy way to advertise online. When signing up, agents are given the option of advertising themselves (via zip code or custom email list – more on this later) or advertising a specific listing. 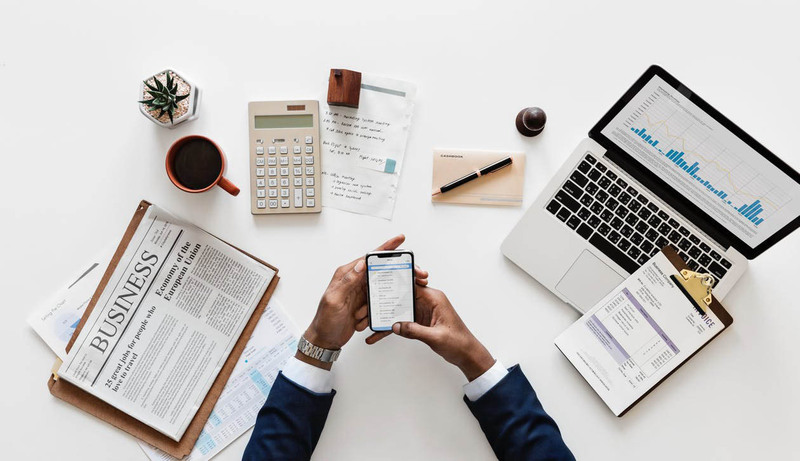 Pricing depends on a few things, such as how long they lock you in for or which zip code you want, but the biggest factor will be with how many impressions you decide to pay for. 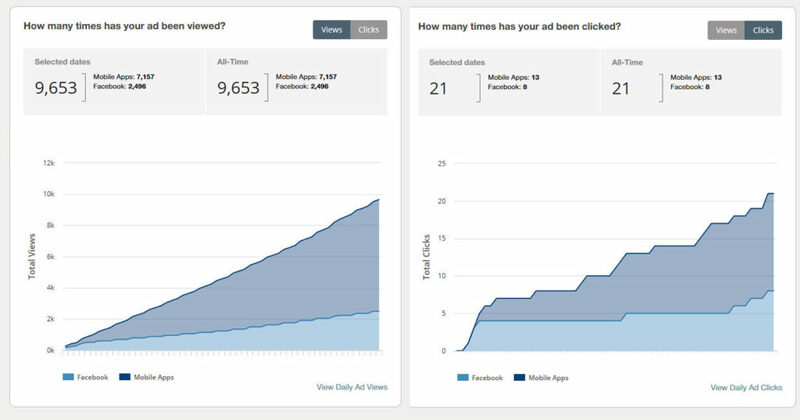 a) You get to decide between Mobile + Facebook Ads and/or Desktop ads. The nifty thing about AdWerx is that your ads appear basically all over the Internet. From CNN to ESPN to Reddit to Wired – we’ve seen AdWerx ads creep up just about everywhere we personally browse. Furthermore, AdWerx allows you to advertise on Facebook without having your own Facebook Business Page – which is pretty convenient for those who opt to only maintain their personal page. b) Advertising to your sphere via an e-mail list can be pretty impactful. a) The data AdWerx provides is lacking. 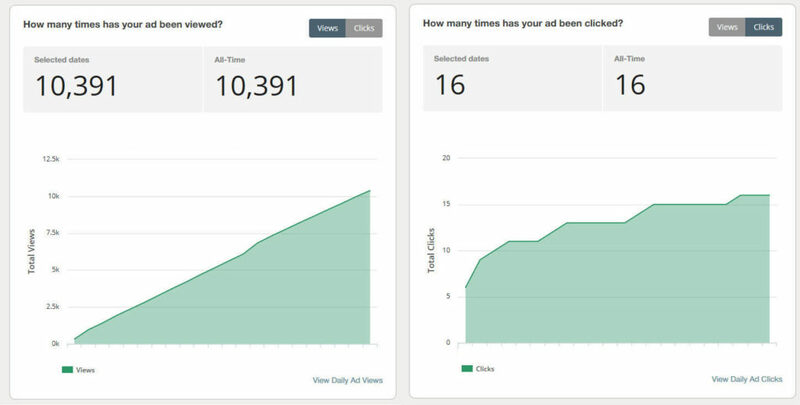 When you run a campaign with AdWerx, all you’re given is the number of impressions and clicks of any particular ad. Nothing else. Where’s the geolocation information? Perhaps an IP Address? Nope. None of that. Digital advertising is about data – without it, the industry’s whole value proposition gets turned upside down. For us, this is a big deal. Example One – Mobile / Facebook Campaign. Please note: The x-axis is the date. 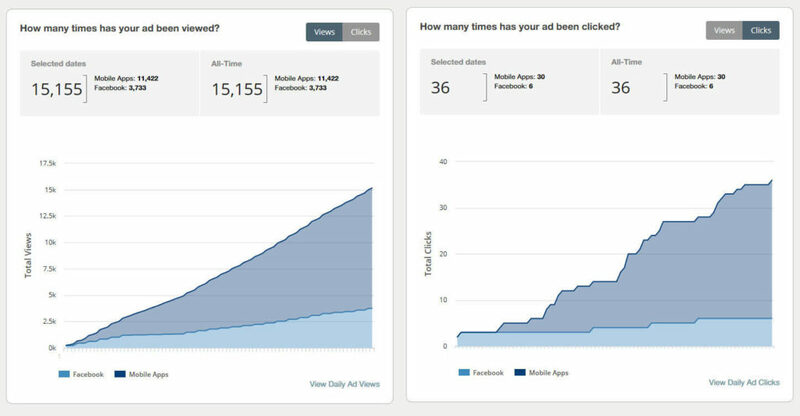 Example Two – Mobile / Facebook Campaign. Please note: The x-axis is the date. b) The click through rate (CTR) is low. According to the campaigns we have seen, AdWerx is at about .002% CTR. Or about 1 click for every 425 impressions. Now, we understand that clicks aren’t the only metric when it comes to advertising and brand positioning, but to put this into context, our campaigns that we run for agents on Google Ads have anywhere from ~8 – 14% CTRs. c) Unless you choose to advertise to your e-mail list (sphere advertising), you have little control over who you’re targeting. 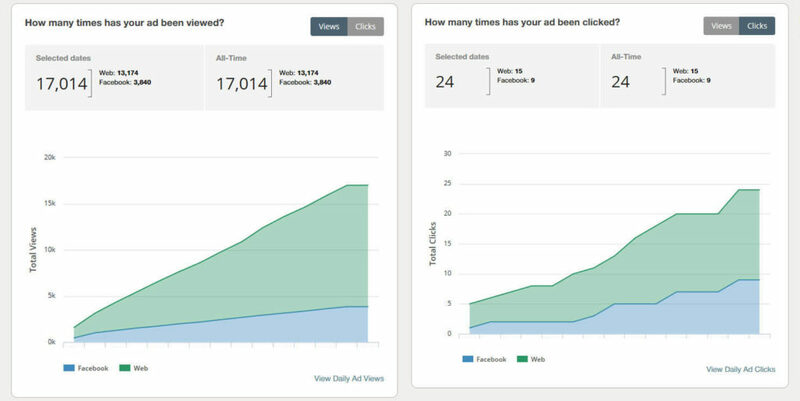 In a lot of ways, agents are meant to give AdWerx the benefit of the doubt with regards to their targeting algorithm. The fact that we at warhol + west see these ads regularly indicates to us they’re using standard retargeting practices that haven’t really quite proven to be efficient in real estate. After all, if we’re seeing the ads because we visit a particular broker’s website – the 1.3 million real estate agents in America are also seeing other agents’ ads too since seemingly AdWerx hasn’t found a way to differentiate potential buyers and sellers with professionals in the industry. Here’s also something to ponder: In two separate campaigns – with two different agents – who happened to be targeting the same zip code, there was a particularly large amount of clicks coming from one no-name town in Kansas despite having our agents being in Wisconsin. (For those wondering, we used Google Analytics and UTM tags to track this more specifically). Questionable results at best. Desktop Campaign – Please Note: x-axis is date. d) Of all the agents we have known to use the service, none were able to attribute AdWerx towards a sale. With that said, it’s of our opinion that agents should lean towards staying away from AdWerx – or at the very least avoid long term contracts with them so you can see for yourself. The exception to this rule would be if you have a solid e-mail list to share with AdWerx to utilize their custom sphere advertising. If you’re looking to expand your digital advertising efforts, we recommend reaching out to us – we’re super proud of what we have been able to accomplish for our agents! Contact us today! Warhol + West is a Chicago based real estate marketing agency. From web design to headshots, we pride ourselves on providing agents with a superior level of support to help make them stand out from the crowd.